If you have a child who loves animals, you’ve probably made multiple trips to the zoo and aquarium. But sometimes poor weather or distance may prevent you from venturing out to see the animals. If this happens to you, don’t worry. Your animal enthusiast can still enjoy watching the animals. 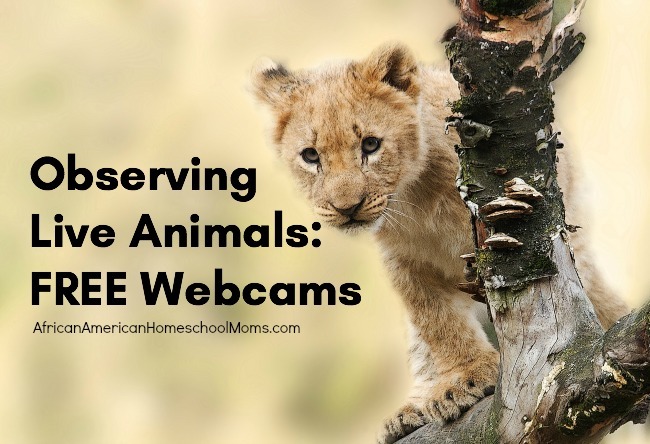 Live animal webcams allow animal enthusiasts to observe animals all over the world. These webcams are stationed in zoos, parks, and nature preserves around the world. All you need to do is visit a website providing a live stream of the animals and begin watching any time, day or night. Africam: Enjoy a live look at the African wild via the site’s many Safari Cams. This one is a Thorpe family favorite! Monterey Bay Aquarium: Choose this famous aquarium’s webcams to see what birds, sea otters, and penguins are up to. Panda Cam: If you’ve got a panda lover, you’ll want to see the pandas in action at the San Diego Zoo. UStream Animals: This website allows you select from multiple webcams. Tune in for footage of eagles, owls, hummingbirds, and the animals in the sea. Animal observation is not only fun, but it also provides an excellent opportunity for children to practice observational skills. You can take observation to the next level by having your child make written observations about animal behavior. I’m happy to share the observational worksheet I created. It’s called Webcam Observation Log. Grab your copy and start your animal observations today! Great resources! I even love watching these.